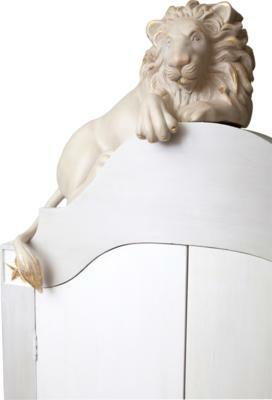 ‘Amos’ is a wardrobe with a full-bodied lion sprawled over the top. Although the lion can be removed, the strong lion paws will always be part of the wardrobe. 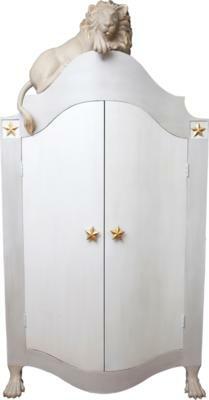 The interior of the wardrobe is fully adjustable. The rail and all the shelves can be reconfigured or removed. The entire wardrobe is hand made and the decorative details are hand carved. The wardrobe can be finished in any colour. 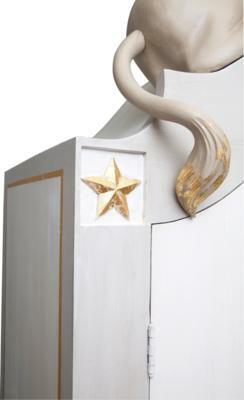 Details are decorated with gold leaf. This item is sold and dispatched directly by Anaiza. Anaiza creates exquisite furniture pieces drawn from the creators' love of animals, beauty and children. Inspired by antique furniture, Anaiza then re-designed these pieces to make them more modern. Lions, giraffes and elephants are included in Anaiza's designs, to bring life to children's imaginations.